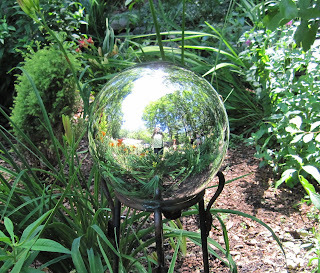 Hello to all from Garden Bloggers Summer Camp, also known as Buffa10. I am having a great time and can’t believe it is almost over. Whew! The activities just never seemed to stop! Yesterday was quite a day. 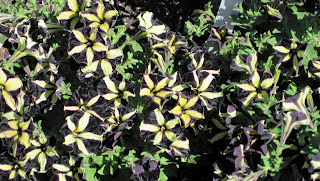 We all got to see a demonstration garden with all kinds of annuals and perennials being grown – get this – just to see how they would grow up here in this climate. It was at a place called the Erie Basin Marina Test Gardens. When we got there, we all got some little flags so that we could mark our favorite ones. I sure had a hard time deciding but picked this one as one of my four favorites. It’s a pretty black and gold petunia that reminds me of my alma mater Purdue’s school colors. I thought they might call it ‘Boilermaker Pete’ or something clever like that but I think they are calling it ‘Petunia Phantom’. I guess that’s a good name, too. I think it should be available Spring 2011. 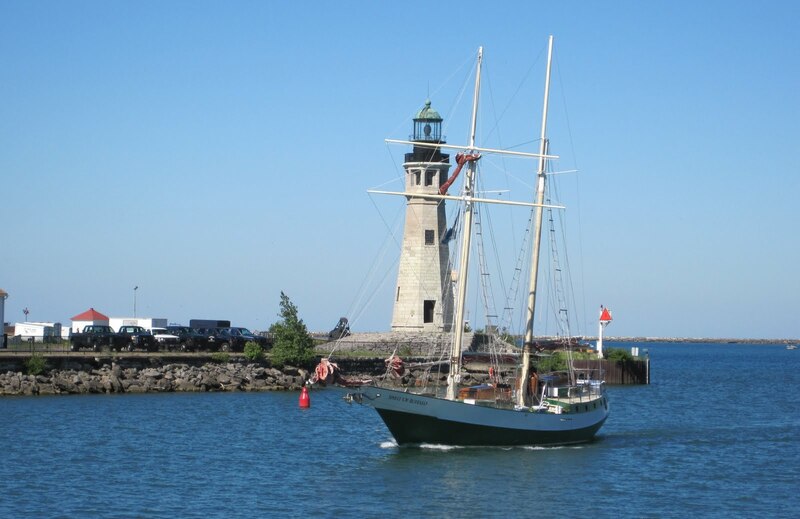 While I was at the demonstration gardens admiring the flowers, I turned around and saw a big ship and a lighthouse. Turns out that I was right on the shore of the Erie Canal that flows into Lake Erie. Another inspiration for a water feature, but probably a bit big for my garden. After everyone voted with their flags for their favorite flowers, we got back on the bus (did I mention we were on a really nice touring bus?) 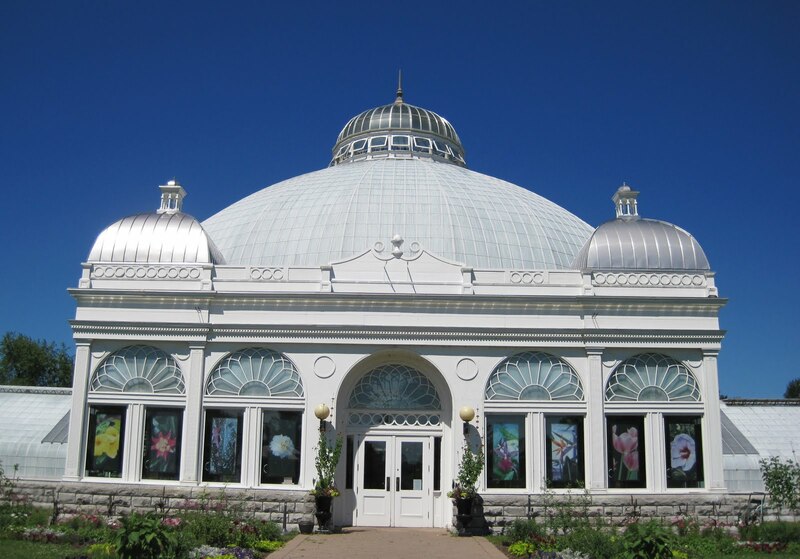 and drove over to the Buffalo & Erie County Botanical Garden. They had a big conservatory there that was full of all kinds of tropical plants. It was so big I could only take a picture of part of it. Then we got back on the bus and drove out a ways to a place called Lockwood's Greenhouses. They had a nice lunch for us there and we got to stroll through their retail garden center and see some of the greenhouses, too. Now, don’t be surprised, but I bought myself a DeWit Cape Cod Weeder and a DeWit Disc Weeder while I was there. I needed a new Cape Cod Weeder on account of the garden fairies stole mine. And I just thought the Disc Weeder was cool looking. So after we all had finished seeing the greenhouses and buying neat plants and other stuff that people swore they couldn’t find in their hometown garden centers, we got back on the bus and went to see the gardens of Mike and Kathy Shadrack. 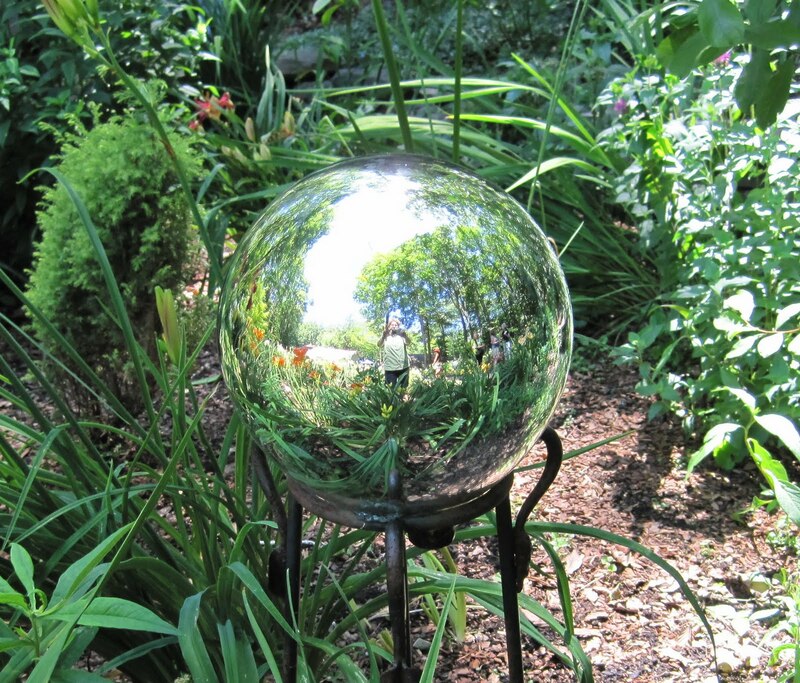 That’s where I took that self portrait above, in a gazing ball in their beautiful gardens. 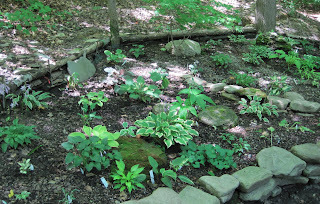 Turns out, and I didn’t quite know this until we got there, that Mike Shadrack has written several books on hostas and is quite a fan of miniature hostas. 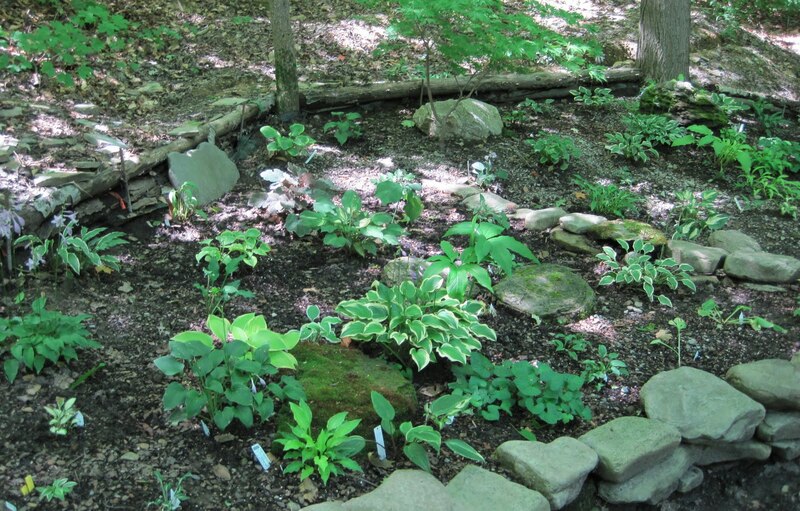 In fact, he and his wife have a new book coming out this fall, The Book of Little Hostas, that is all about miniature hostas. And get this! The Shadracks know the owners of Soules Garden back home, which as you know is where I’ve bought many a miniature hosta. They said to tell them “Hi” and that they should visit sometime because they haven’t been to the Shadrack's garden, ever. I can hardly wait to get back and gloat about tell them about seeing the Shadrack’s amazing gardens. Goodness, this letter is getting long. There is a lot more to tell everyone about Garden Bloggers’ Summer Camp, also know as Buffa10, but I’ll wait until I get home to do so. But I've got to say before I close that our camp counselors, Elizabeth and Jim, have been outstanding. They really came up with some great gardens for us to see. And the food they've picked for our meals... well, let's just say I might need to go to another kind of camp later, if you get my drift, to work off some of those calories. Delicious! Anyway, you can plan on me going to “camp” again next summer because Garden Bloggers’ Summer Camp is a great place to meet new gardening friends and talk about gardening pretty much non-stop. Fun! Love to all from GBSC! Love it! Those of us still at camp had a nice afternoon and most are going out to dinner tonight. I am sure you will be missed! So nice to meet you in person, Carol, after all these years of reading you. Hi Carol, It was like camp, only a really cool camp where the food is fantastic, your bunk is an air conditioned suite and all the other kids are really nice! It was a blast -Boiler up! You certainly covered all the high spots. I was so busy talking to new friends abd trying to decide where to put my flags that I forgot to look at the Erie Canal. As your camp counselor, I recommend you come back again for Garden Walk Buffalo - that's not like camp - it's like speed-dating garden viewing. Sounds like a great time was had by all! I've just found your blog and am enjoying reading your posts. You've planted a seed in my mind about installing a water feature. Will be following you. Camp sounds like so much fun. Those water features (Niagra Falls and the Canal) would be a bit tricky trying to tuck them into your garden. this has been so much fun to do vicariously through all the different bloggers who went, I may just have to plan on going to the next garden meet. Thanks for taking the time to share with us stay-at-homes and inspire us. Never has a summer camp been so much fun with so many 'instant' friends. I am looking forward to all the Buffalo posts to see what I missed while actually being there. It seems like you're really having a great time together on the Summer Camp. And it also looks like you get the chance to visit some new gardens and enjoy the plants. I can easily understand why you picked the perennials on the picture. The Erie Basin Marina Gardens really seem to be a beautiful place. I have some perennials in my garden too. Just love them. That was the funnest camp I've ever been to. I want to go every year! Good job summarizing it. I'm still trying to get used to being home and fending for myself for dinner. It was wonderful to see you again! I just wish we'd had more time to chat.